If you've applied MS015-11 http://support.microsoft.com/kb/3000483 in your environment, you HAVE TO make a GPO change to turn the vulnerability protection on. Specifically, you have to enable the Hardened UNC Paths setting in Group Policy under Computer Configuration/Administrative Templates/Network/Network Provider. It talks about the specific setting in the KB article. If you don't have a PolicyDefinitions folder, then copy them to the same locations as the original on your management station. This morning I'm thinking about quadcopters. These, like all rotorcraft, fly by force of will. Unlike the graceful wings birds and sailplanes, they beat the air into submission. It's energy inefficient too. The many spinning props on a quadcopter burn through batteries really fast. Several people have created solutions to this. I propose another. We have techniques from sewing sails and parade balloons for creating envelopes that inflate into specific 3-d structures. If you disassemble a digital blood pressure machine it has a small air compressor in it. A person that had time and motivation to do so could make a set of inflatable wings that a quad could use for the transit portion of its mission, then deflate and retract them for hovering. It could use the rotors for elevator and aileron control or have traditional control surfaces. The wings are subject to loading forces and I doubt they would support them with just air pressure. I see this built with a telescoping set of rods inside the wings that are spring loaded to retract. The air pressure extends and inflates the wings. Venting the air causes them to deflate and retract. What I'm working on: The emDrive and playing with physics. 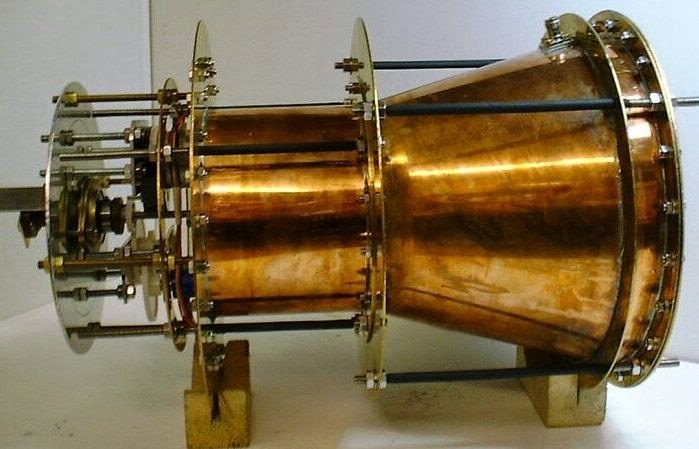 I read about this device, The emDrive. This device is.. claims to be.. a reactionless thruster. It pushes a spacecraft without throwing anything out of the spacecraft. As long as you keep adding energy, i.e from solar cells or a reactor, it keeps accelerating the spacecraft. This is revolutionary, and if true it has the potential to change human civilization as much as the printing press, steam engine, and Internet. It is the enabling technology we need to colonize other worlds. It looks complicated, but it really isn't. It is an asymmetrical microwave resonator. In English, this is a box that echoes microwaves. Exactly why it creates thrust is up for debate. The author proposes a that it is caused by radiation pressure. Radiation pressure is the incredibly tiny force from a photon bouncing off of a surface. Two factors in this design amplify and direct this tiny force to make it useful. First, the photons bounce a lot. Microwave resonators can bounce the same photons around thousands of times before they are absorbed. Second, because it is cone shaped, one end is larger and absorbs more energy than the other. This difference in energy absorption creates thrust. The problem with this device is that physics, as we understand it, says it's impossible. The law of Conservation of Momentum says that in a closed system is not affected by external forces the total linear momentum of the system cannot change. This device should not work. So how do I fit? I think this is going to change the world, and I want in. To design one of these I need to design a cone shaped microwave resonator. This requires knowledge in Microwave engineering. This entire discipline is built on Maxwell's Equations. (specifically, the 3 dimensional wave equation with boundary conditions. These equations are written in the language of vector calculus. The highest math I've taken formally is Algebra 2 in high school. I'm now about 1/2 done teaching myself Single Variable Calculus. After that I can do multi-variable calculus and finally vector calculus. Then I can -start- work. It is very frustrating to stand at a locked door of opportunity and thumb-twiddle while learning the secrets to opening the door. I'm coming, door. I'm coming. I'm thinking really hard about this conservation of momentum thing too. My son's xbox controller vibrates when I get shot by spinning a off-balance counterweight. I looked up the physics and the force is, in the direction of the counterweight, equal to the unbalance times the angular velocity (w) in radians squared. The unbalance the mass of the counterweight times the distance of the center of the unbalance to the center of rotation. Could a system with a counterweight that slides to the perimeter of a rotating disk only during half a cycle of rotation create an imbalanced force and "reactionless" thrust? The system could be made even simpler. The counterweight could be fixed on a rotating disk and accelerated during half of the rotation, then decelerated during the opposite half. This acceleration and deceleration moves the w term of the force equation around and should "make it go". 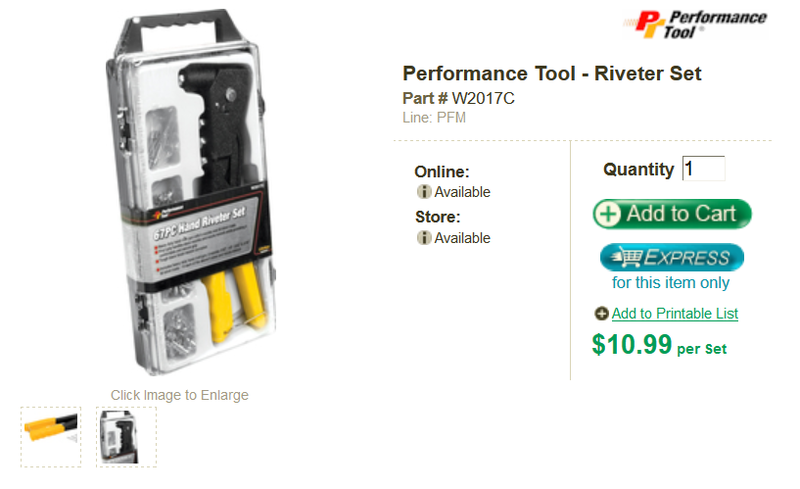 Unfortunately, a patent search indicates that this type of device has been invented and patented over a dozen times. A search of the internet indicates that it doesn't actually "work". The time hasn't been a complete loss. I learned a great deal about working in Acrylic. I used a scroll saw to make plastic gears. That was pretty cool and worth the time invested. This says that the force is equal to the mass flow rate times the exit velocity plus the difference in nozzle exit pressure and ambient pressure times the area of the exit. In a system that recycled the reaction mass, that first term would net out to zero. Question: Is it possible to fiddle about with that second term to make thrust? This weekend I replaced the radiator on my dearest's 2002 3.8L Dodge Grand Caravan. It wasn't terribly difficult, but there are a few gotchas to know about. Remove the negative battery cable. Really do this, as you'll be working right next to the ABS impact sensor. I also cover the battery with a towel to prevent accidental sparky oops. There are two bolts and two plastic pins that hold the plastic radiator bar cover on. Remove them. Put alignment marks on the radiator crossmember and remove the four 13mm bolts that hold it in place. If you jimmy the plastic cover about so you can reach the bolts, it's possible to remove this without removing the hood latch. That's a good thing, as the hood latch adjustment is not something I enjoy. Lift the crossmember up and set it out of the way. The hood latch cable is still attached so it won't go far. Remove the electrical connectors from the fans. There is a red plastic clip that has to be pushed into the unlocked position, then squeeze the connector and it should slide off. Now the two fans can be removed. They are each held on by one screw at the top. With that screw removed, they'll lift right up out of the grooves they lock in. Drain the cooling system. There is an almost impossible-to-reach drain plug above the lower radiator hose to do this, or you can remove the easy-to-reach lower radiator hose. Your choice. Catch the coolant (you need room for a couple of gallons) and dispose of it properly so you don't kill the neighbors cats. Remove the upper and lower radiator hose. Remove the coolant overflow hose from next to the radiator cap. Remove the two bolts on the outside front of the radiator that hold it to the AC Condenser and transmission cooler. This next part isn't exactly fun. You want to separate the radiator and AC condenser assembly and then get the radiator out. This requires holding the radiator down while pulling up on the condenser, then once the two separate you pull the radiator up, then out, and set the condenser down gingerly without breaking it. Installing the radiator is moving all of the parts (rubber feet, grommets, and flaps) to the new one and then executing all of the above backwards. The mounting holes for the rubber air dam did not align on my new radiator. I drilled new holes in the rubber piece to match the new mounting holes. You should have grommets in the AC condenser mounting holes that may or may not be stuck to the old radiator or stuck in the old condenser. Find, clean, and move them to the new radiator. My transmission fluid cooler mounting brackets were broken, and the cooler flopping around is what caused the old radiator to fail. If yours is broke, I'll tell you how to fix it. If yours isn't broke, put a big zip tie around it as an anti-murphy measure. There are 6 rivets two each on the upper, lower, and driver's side brackets. On my van all 6 rivets were broken. The upper and lower brackets can be fixed on-car. The driver's side has to be removed to be fixed. I, being a masochist, removed all 3 PITA brackets and hoses for the repair. I have lots of scratches and peeled knuckles for my trouble. If the two "short" mounting bracket rivets on the driver's side are broken, you have to remove the bracket to repair it and fix these before you do the long bracket repairs. It's held in place with one very difficult to reach 10mm bolt. Gingerly, without drilling into the fluid cooler, drill out the old rivets with a 5/32" drill bit. If you are doing the bottom one from one under the car then wear safety glasses. The swarf from drilling will fly into your eyes with cruise missile accuracy. Once the holes are clear, install shiny new 5/32 rivets to replace the broken ones. The rivets from the O'reilly kit fit fine. If you're feeling really fancy, you can add some RTV sealant between the bracket and cooler to help dampen the rivet-breaking vibration. Work has had me swamped. It was nice to spend some time in the shop. My in-laws came over for a bit as well. It was good to see them.